St Joseph's HSS, Trivandrum, Jan 16-Home team and favorites, St Joseph HSS, Trivandrum, kick started the 22nd Fr. Ephrem Trophy tournament by beating Loyola, Trivandrum, by a score line of (39-19) here on Wednesday. A power house in Kerala’s school basketball circuit, St Josephs’s proved their supremacy on their home turf, beating a Loyola team -that couldn't cope with the height and pace of their counterparts . In the low scoring opening match under the beating afternoon sun, St. Joseph’s boys dominated the Loyola defense time and again through speedy counter attacks .Rahul(10) and Iswan(7) top scored for St Joseph’s HSS.SV while Harigovind top scored for Loyola (6). In other matches that started later in the evening, St. Thomas HSS beat Sarvodaya Vidyalaya by a score line of 47-35 points. Franko of St Thomas HSS scored 26 points whose performance made the difference between the two teams. 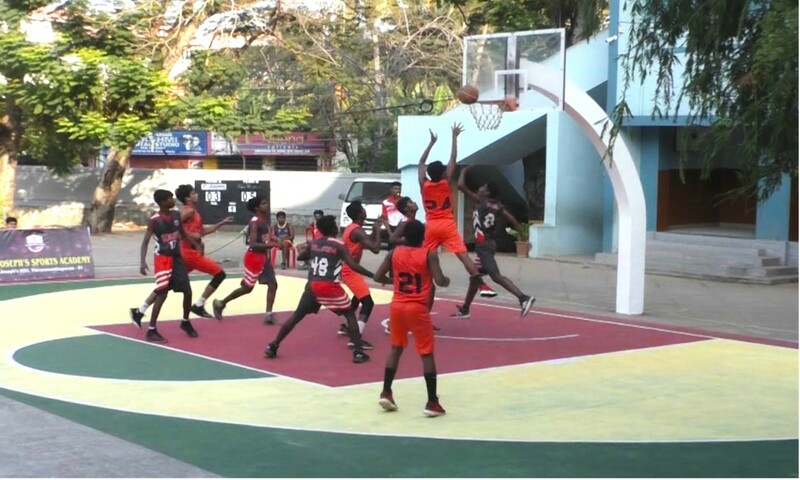 Manu and Abhijith top scored for Sarvodaya Vidyalaya with 14 and 13 points respectively. In the last match of the evening , St Joseph’s HSS B Team edged over and St Mary’s Trivandrum by a score line of 57- 55. Shakeeb with 15 points and Hifas with 12 points scored consistently for St Josephs B team while Joal Eapen Josy and Vikas with 16 and 14 points stood out for St Mary’s.